We are not directly affiliated with Nelson Berry in our Marketing of the $5K Per Day videos or any other products we are licensed to sell directly. Because of this, we are not licensed to use the exact same graphics, or websites, in our marketing, hence, you will see a different look at our sites. However, we are licensed to sell some of these wonderful videos and audios. We may at times link to Nelson Berry's websites, where we are not directly selling the product, where you can acquire other products directly from him. In some instances, the link may contain our affiliate code, where we make a commission if you purchase through us. Please note that while a great number of people have benefited from these videos and audios, and many sincere, unsolicited testimonials have been given to Nelson Berry, we cannot, and do not, guarantee any specific result. 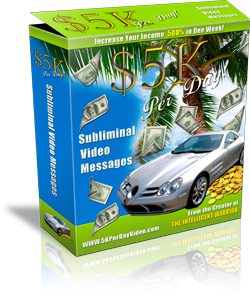 Further, you agree by purchasing that you use these subliminal videos and audios at your own risk. If you feel you have any type of physical or psychological problems that would be aggravated by using subliminal videos or audios, you are urged to get the advice of a doctor or other appropriate licensed professional prior to using.